War of Rights is a multiplayer FPS game by Campfire Games. Players are dropped into the the perilous days of the American Civil War, in the Maryland Campaign of September 1862, and can play out famous battles including the Battle of Antietam and Harper’s Ferry. Historical authenticity: Experience a recreation the events of the Maryland campaign of 1862 during the American Civil War. 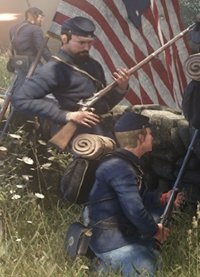 Realistic ballistics: Rifle flip-up sights will be needed for making shots over greater distances, and players will require mastering the slower bullet speeds of the era. Campfire Games is excited to announce that War of Rights has been approved on Steam Greenlight along with reaching 50% funding. Campfire Games' Kickstarter for War of Rights has been successful and the game is now funded, and you can still support the game via PayPal. Description: Players are dropped into the the perilous days of the American Civil War, in the Maryland Campaign of September 1862, and can play out famous battles including the Battle of Antietam and Harper's Ferry. Elsword Releases Final 3rd Job Update - And We're Giving Away K-Ching! KOG Games launched Elsword's third and final update in the 3rd Job update series today. Splash Damage’s first-person shooter, Dirty Bomb, opens its floodgates on Tuesday, June 2, so prepare to get rich and die trying!